1 What will it take to draw? the art of drawing in the coffee can be quite accessible for beginners, special, if you use simple methods and techniques. Let's see where to start and what ways of drawing on coffee there. What will it take to draw? Take milk 3,5%, or better yet rich cream 33%, coffee, sharp toothpick, stencil or a confectionery syringe. First, try a stencil method, it is the most simple. To do this, a good cook and a thick organic coffee, pour into a preheated prior to 40aboutWith the cup. Milk is heated to 50-70aboutWITH, whipping mixer until a stable and homogeneous foam. Dairy whipping cream or foam in an amount 1 Article. l. Pour on top of the coffee - this will be our "canvas". Draw as soon as possible, because coffee does not cool! The easiest way - is to cut and dried. It can be easy to make yourself any favorite theme. Circle stencil made from construction paper slightly larger than the diameter of the Cup, a stencil drawing should not go out of its loops, be smaller, slots better do not thick. Figures do on whipped Penke using cocoa powder, chocolate, cinnamon. If we take a cup of espresso, the foam can be applied to the image using the powdered sugar, it will also look beautiful on a dark background. One of the most difficult techniques of drawing etching. It will require some skill, because they have to use a special stainless steel pitcher with a sharp nose, called pitcherom. From it trickle fed properly frothed with steam for drawing milk. This method is called pitčing, it is used by professional baristas. Also used for drawing and confectionery syringe with a fine nozzle, which poured thick syrup or pre-melted chocolate. To draw important, to hand did not tremble, required preliminary training. 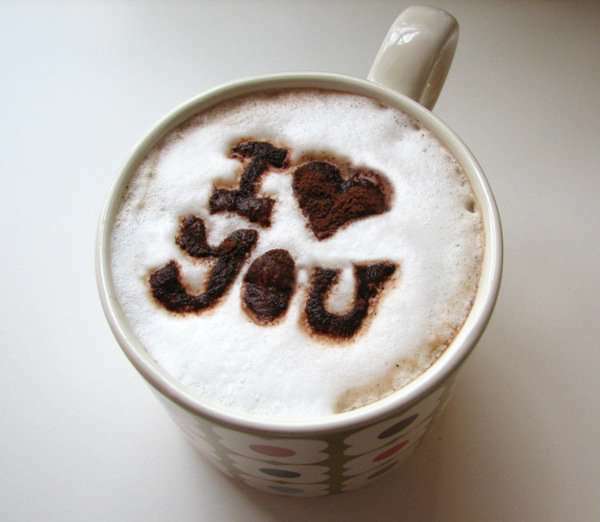 this method, when used for drawing chocolate topping, syrups called Cappuccino Art. Additional decorations in the form of vignettes and patterns, It can be coated with a toothpick or other object, obtained by conducting etching using contour. 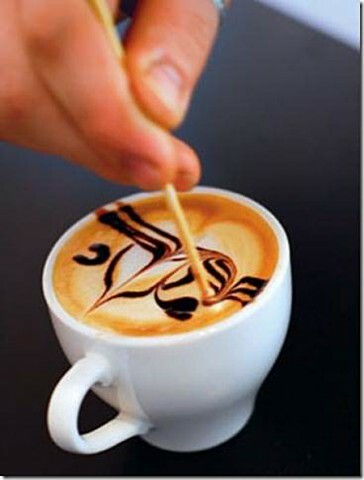 Drawings on coffee you can do with thin sharp object, It is perfect for this purpose useful to the ordinary toothpick. The principle of operation is, that it can help create patterns on a white background by diving to the desired depth, and of strokes, exciting the lower layer of a dark color. 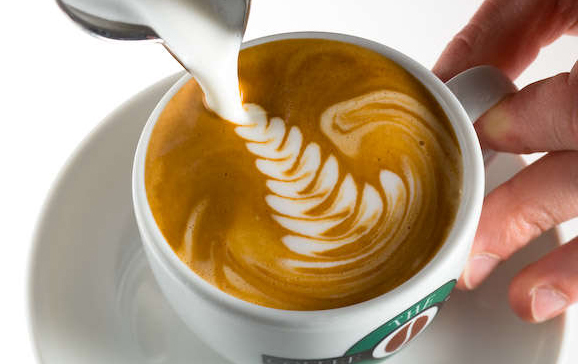 This method is also called a classic latte art. With it usually draw geometric shapes, ovals, zigzagi, a variety of flowers, as well as other thematic figures. Often white milk combines with drops of dark chocolate, syrup, that with a toothpick paint the zigzags, receiving various drawings as sun, kaleidoscope, fantasy patterns etc.. 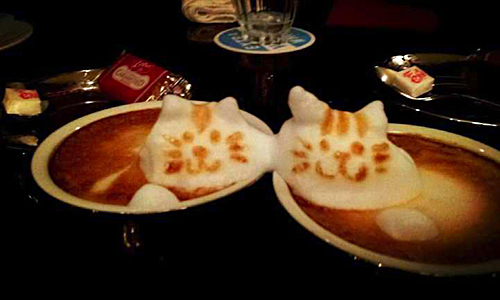 The original method of creating three-dimensional shapes in coffee foam offered in Japan. This is a real work of art, judge for yourself! 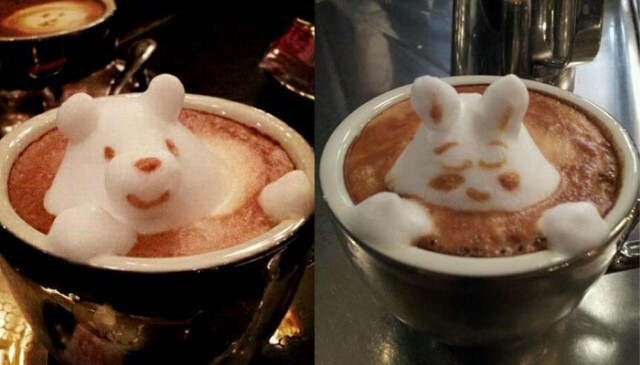 To make such cute critters volume, must be able to properly frothed milk, but, Alas, professional secrets of the master are in no hurry to open. However, you can try to repeat, and suddenly get? Drawing on the coffee is very popular, with 2004 year there are international competitions, which are sometimes the most real masterpieces, even living a very short time. This is an amazing and original art, and try his hand at painting on coffee every possible.